Change is in the air! Can you feel it? The sun is setting earlier and people came out in droves to vote in the midterms yesterday. In 15 days you’ll be enjoying some fine yams and pumpkin pie. Here’s to welcoming the holiday spirit! We’re ready. We’re gearing up for an exciting night tomorrow as Anna of the North drops by for her sold-out show with Ambar Lucid! We will have a handful of tickets available at the door, so fear not broken-hearted fans! Show up early and we may be able to accomodate you. Your Friday plans just got an upgrade as we have a free show happening with a fresh face in the Bedroom Pop scene. Viva Pomona! 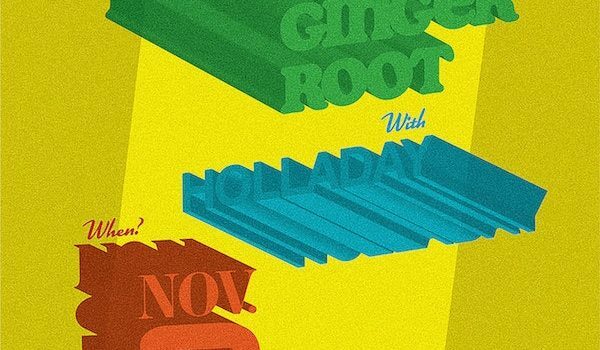 presents an evening with Ginger Root and Holladay. Fans of Toro y Moi, Jay Som, and more will dig it — don’t believe us? Hear for yourself! In the event that your life has been lacking in glitter and mashups, Bootie LA is back to fulfill that void on Saturday. Join us, dancing queens, for your own glitter makeover, endless dancefloor faves, and photo-ops galore at this legendary party. Embrace your inner unicorn! Next week kicks off with a bang — Monday bore, no more. Start it off right with a visit from Holy Wave, featuring local faves Automatic and Duress (Joojoo from Froth). The fun continues Tuesday with a show from Mutual Benefit. Make sure to show up early to catch Gabi opening up the evening — she just dropped her second solo album last month and we’re fans! As you make your Thanksgiving plans with friends and family, know that we’ll be here for post-feast weekend hangs! Friday night 11/23 dance off that fourth helping of mashed potatoes at the Soul Shakedown. Clifton aka DJ Soft Touch will be spinning raw funk and heavy soul all night with special guest DJ Dennis Owens, of beloved Long Beach funk celebration, The Good Foot. Come by to shake and shimmy with us! We’ll keep this short and sweet today. There are less than eight weeks left in 2018 and they’re much better spent together. The garden misses you! Drop by soon, we’ll be thrilled to see ya.